Mr. 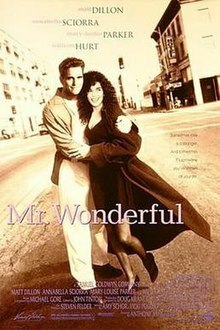 Wonderful is a 1993 romantic comedy film directed by Academy Award winning director Anthony Minghella. The film stars Matt Dillon, Annabella Sciorra, Mary-Louise Parker, William Hurt and features one of the few appearances of Vincent D'Onofrio as a romantic character. Gus DeMarco (Matt Dillon), an electrician, wants to purchase a bowling alley with his friends. The problem is that he still pays alimony to his ex-wife, Leonora (Annabella Sciorra). Gus realizes that if Leonora remarries, he can stop paying alimony, and attempts to match Leonora with various men. James Gandolfini has a small part as one of Lenora's would-be suitors. In the course of his match-making, and after Gus breaks up with his girlfriend, Rita (Mary-Louise Parker), while Leonora ended things with her professor boyfriend Tom (William Hurt), Gus and Leonora discover that they still care about each other. The film received mixed reviews. It holds a 52% rating on Rotten Tomatoes based on 21 reviews, with an average rating of 5.8/10. ^ Travers, Peter (October 15, 1993). "Mr Wonderful". Rolling Stone. Retrieved June 9, 2012. ^ Maslin, Janet (October 15, 1993). "A Story of Electricity: Men, Women and Con Ed". The New York Times. The New York Times Company. Retrieved June 9, 2012. ^ Rainer, Peter (October 15, 1993). "MOVIE REVIEW : 'Mr. Wonderful' Understands the Mating Game". Los Angeles Times. Retrieved June 9, 2012. ^ "Mr. Wonderful (1993)". Rotten Tomatoes. Fandango Media. Retrieved April 17, 2018. ^ Fox, David J. (October 19, 1993). "Weekend Box Office : 'Demolition Man' Fends Off 'Hillbillies'". Los Angeles Times. Retrieved December 30, 2010.